Due to the number of visitors to Michigan's top tourist destination and this very popular time of year we have moved the overall venue to what will be a safer, less obstructed area of Frankenmuth just beyond the Riverplace shops. We have designed an incredible spectator friendly course that will bring the true essence of the run - bike - run format and Powerman to the forefront. With a cross-country style start mixed with a road course that will take you down main street and through the covered bridge. The bike course is going to bring you back by the finish line and run courses looping around right in front of friends, family, and spectators with the aid station right there as well. Open at 6:30am not before! Located in the very large grass area just behind the Riverplace shops. Athletes exit the parking lot to a right turn on Weis, Left on Jefferson, and then straight out from there to the rest of the course. 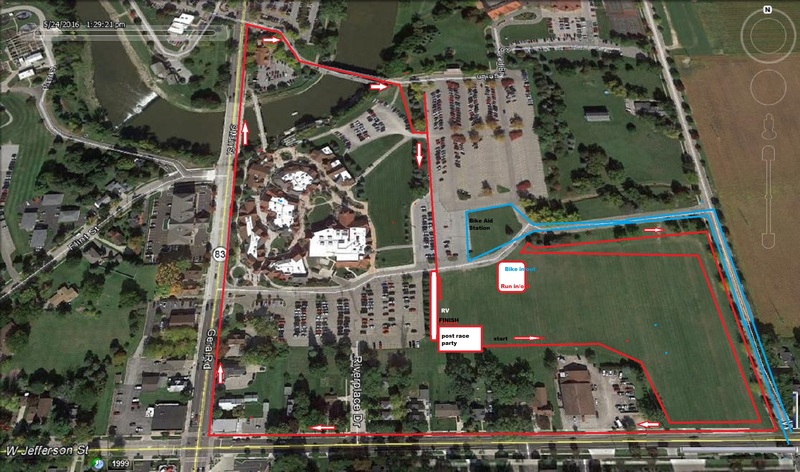 Right on Lewis, Left on Townline, Left on Bray, Left on Ormes, back to Jefferson where they will make a Right on Weiss, Left into the parking lot heading towards the transition area, to the turnaround just in front of the transition area. It is a 2 loop or 4 loop course for Sprint Powerman and Powerman athletes respectively. This course is a mixture of country farm roads, flat and smooth, The aid station will be located right in front of the transition area, as well as the finish line. It is a 9.2 mile loop which you complete 2 times for the Powerman sprint distance and 4 loops for the Powerman distance. Aid Station Powerman distance athletes only, You will hit this 4 times on the bike. Water, Lemon-lime Gatorade Endurance Formula and Energy Gels will be available. 1.5 mile or 2.5k loop. Powerman distance 4 loops, Sprint Powerman 2 loops. Keeping the entire race fast and exciting for both athletes and spectators. Elites will start us off at 8:00am followed by the age groupers at 8:05am. Aid Stations: Located every mile with Lemon-Lime Gatorade Endurance Forumula, Hammer Gel, Water, pickles and jolly ranchers. Well, athletes, the bottom line to the new course is it is a barn burner. There is not much out there to separate you so this is just going to be some good old fashioned Red line racing! You will have to watch your fellow competitors and gauge how he or she is looking and race hard but race smart. I know that is not a huge tip, but this is just a flat, fast, red line type of course. It will be easy to get in the zone, get focused and let it rip.